Creative Scotland, Creative Skillset and Left Bank Pictures today, Thursday 3 March 2016, announce the completion of an intense trainee programme for twenty five Scottish-based trainees on the award winning, high-end TV production, Outlander Season Two. Supported through Creative Scotland’s ScreenSkills Fund and Creative Skillset’s Trainee Finder Programme the programme was established to foster practical TV production skills training for young people to develop the skills and professional experience needed to progress within the film industry. For the past 18 months, the trainees, aged between 19 and 29 and from across Scotland, have experienced working on location and in the Cumbernauld studios, learning from the experienced and talented crew members employed on Outlander across a wide variety of creative and technical roles including camera, costume, assistant director, carpenter, art department, props, plasterer and production. To enter the programme trainees submitted their CVs to Outlander. Shortlisted applicants were then interviewed by a variety of Heads of Department. Those demonstrating commitment and passion for working across craft and technical departments in TV Drama, and skills relevant to the trainee role they were applying for, were selected to support their development and equip them with the skills necessary to sustain a career in the industry. Natalie Usher, Director of Screen, Creative Scotland, said: “The strength of the screen sector relies on a continuous flow of skilled and creatively ambitious craft and technical crew. The Outlander trainee placement scheme is one of a number of valuable initiatives taking place across Scotland to develop a skilled and diverse workforce, an ambition outlined in our Screen Strategy. Ruth Palmer, TV Partnership Manager, Creative Skillset, said; “Creative Skillset are delighted to have been able to help establish the Outlander Trainee Programme through our Trainee Finder Service and to have been able to support both season one and two. Providing structured trainee opportunities in TV drama is a key priority for us and the work we do though the High End TV Council to ensure we grow the next generation of UK drama crew. Starz, in association with Sony Pictures Television, has recently announced the Season Two premiere of its hit original series “Outlander” on UK Channel: Amazon Prime on 10 April 2016. The eagerly awaited second installment will be 13 episodes and is based upon the second of eight books in Diana Gabaldon’s international best-selling Outlander series, entitled Dragonfly in Amber. Outlander is produced by Left Bank Pictures, Tall Ship Productions, and Story Mining & Supply Company, in association with Sony Pictures Television. Outlander is adapted from Diana Gabaldon’s international best-selling series of seven books, which tell the story of Claire and James Fraser, using time travel to slip between 18th and 20th Century Scotland, the series was written and executive produced by Ronald D. Moore (Battlestar Galactica, Star Trek: Deep Space Nine, Star Trek: The Next Generation). Production spend figures in Scotland reached historical highs of £45.8m in 2014 largely due to Outlander establishing itself in Scotland. The production engaged more than 300 crew and 37 trainees across craft and technical departments, providing valuable skills development opportunities and over 2,000 supporting artist roles were cast from within Scotland and the rest of the UK. Season two of the Outlander Trainee Placement Programme received £80,000 from Creative Scotland’s Screen Skills Fund and £57,000 from Creative Skillset’s Trainee Finder Programme and supported 26 trainees. 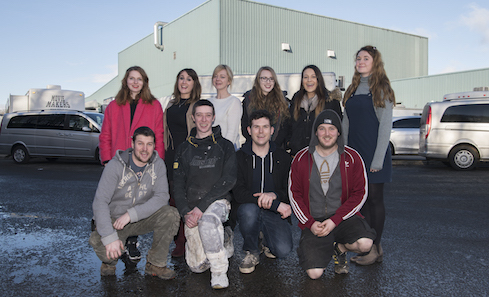 Season one of the Outlander Trainee Placement Programme received £189,000 from Creative Skillset’s Trainee Finder Programme and supported 38 trainees. All sums were match funded by Outlander. In early 2015, the Scottish Government announced a new £1m Screen Skills Fund to support programmes and initiatives, in partnership with industry and other public bodies, which directly addressed four priority areas across the screen sector, including development, production, exhibition, and distribution. Administered by Creative Scotland, the fund was open for applications from organisations and consortia in April-May 2015. Access routes into the industry focusing on employability, encouraging and increasing workforce diversity and emerging talent development programmes.